Viewpoint Culture Why is College So Expensive in the United States? College can be quite expensive, and many times, students across the United States cannot go to the college of their choice due to their financial status. But, what makes college so expensive anyway? Why would an undergraduate degree at a top-tier school amount to more than +60k a year? The student debt amounted to college loans is astronomically high, and many students will pay loans months after graduation. Oxford and Cambridge are both schools in the UK and are placed first and second. The two others after are both American schools: Cal Tech and Stanford. According to CNN Money Oxford’s tuition for an undergraduate degree ranges for American students between $19,860-29,230 and Cambridge’s tuition for an undergraduate degree ranges from $20,400-37,800. Cal Tech has a tuition fee of $48,111 which does not seem incredibly expensive, but including all the expenses amounts to ~ $68,901. 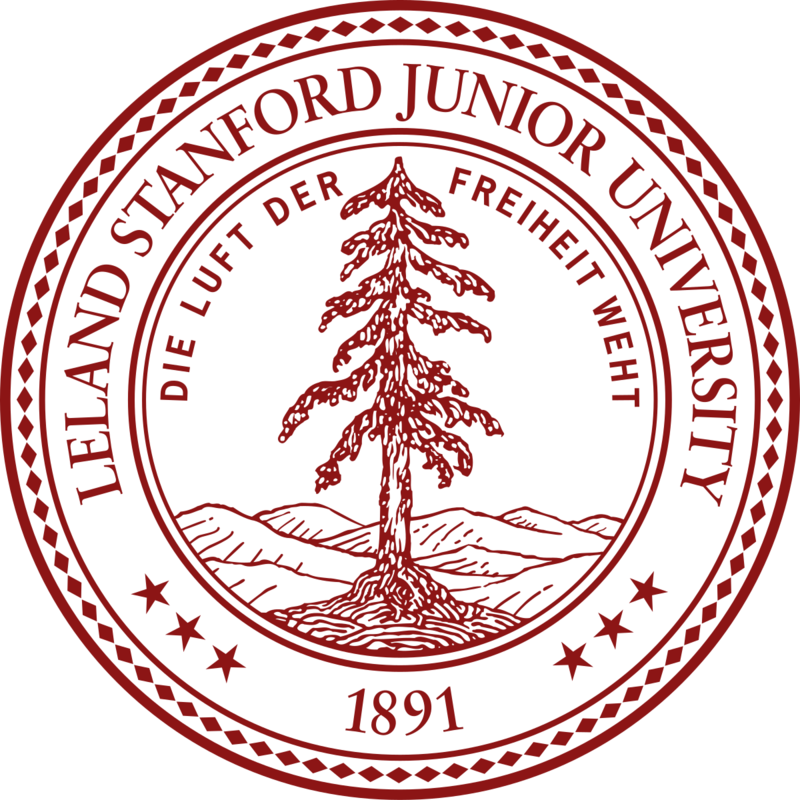 Stanford University also has a starting tuition of $44,757, but with all the expenses amounts to ~ $64,477. So, why do colleges profit so much from students? Why is it less expensive abroad than in the United States? We will come back to those questions later. Students will apply for FAFSA (Federal Student Aid) and scholarships but sometimes even that is not enough to get into their dream schools. Indeed, this increased costs to enroll in college is a modern occurrence that was not prevalent thirty years ago. Tuition has decreased slightly, and a report from the College Board stated that “Annual tuition increases for in-state students at public four-year colleges are below 3 percent for only the second time since 1975”. Still, students are still paying monumental fees for college. In the school year of 1963-64, the average annual cost for a four-year public college, which compromised of tuition, fees, room, and board- amounted to $6,966 in 2012-2013 dollars. For private schools, the price was even greater, growing from $13,575 to $35,074 in 2012-2013 dollars. And compared to the cost to attend college in the 1980’s, adjusting for today’s inflation, a year at a four-year public university costs three and a half times as much as it did thirty years ago. 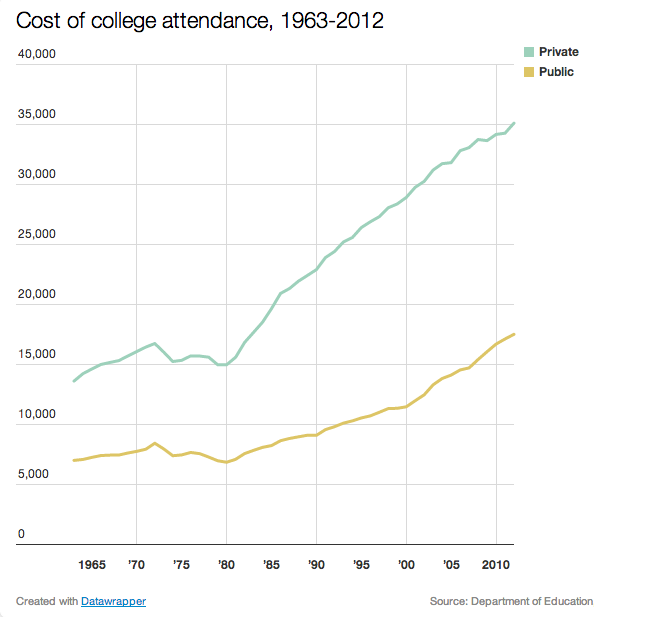 Whether be public, private, non-profit or community colleges, costs have more than doubled. It is obvious to see as many seniors can tell you that private schools are much more expensive than in-state schools or public schools around the country. From 1963 and onward, private schools have truly seen a price spike. Many students are now enrolling at colleges to obtain their Associate or Bachelor degree. Public schools, although more students are attending them, have not seen such a dramatic rise in costs compared to public school attendance. The increasing cost to attend does not affect every student. Colleges do take into account the socio-economic status of the student’s family and background. 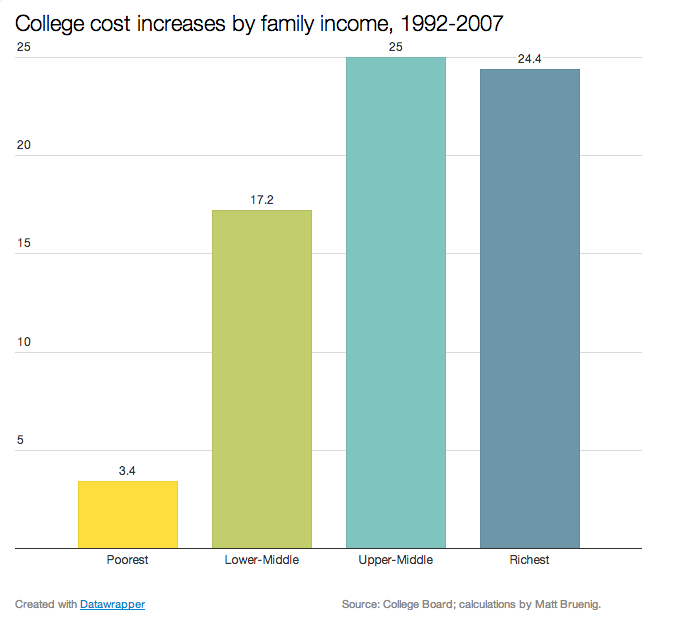 From College Board data, tuition has increased more for the wealthy. There was a 24.4 percent for wealthy families compared to3.4 percent in families with economic struggles. This is prevalent in every economic background. Why are Colleges (USA) – Public, Private, etc.- more expensive? The huge increase in public investment in higher education in the US is greatly larger than it was twenty/thirty years ago. This spending has increased much faster than what government spending could at this rate. Therefore, it is important to see, regardless of the funding cuts made, that the rise in college tuition does equate to a “huge increase in public subsidies for higher education.” As more young Americans go to college, there seems to be an increase in spending. As more students enrolled in college, there was an increase in state legislate appropriations for higher education. (Def. of State Appropriations here). When the baby boomers went to college, the state appropriations skyrocketed and increased more than fourfold in today’s money. In 1980, state funding had increased 390 percent. 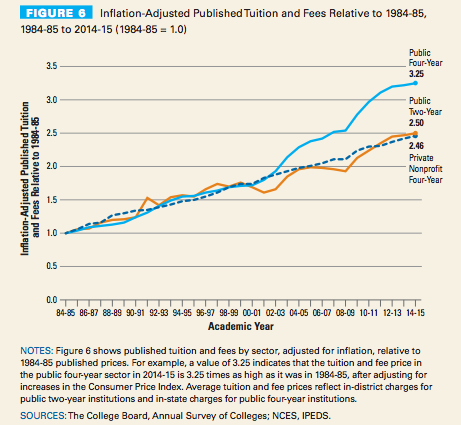 The increase in public money, however, did not reduce tuition. Many students believe that taking in loans is the solution, but the debt that many students take can go on for a long time depending on the job he or she obtains at the end of college. According to New America Foundation, the average indebted student for a bachelor degree borrowed more than $29,384 in 2011. 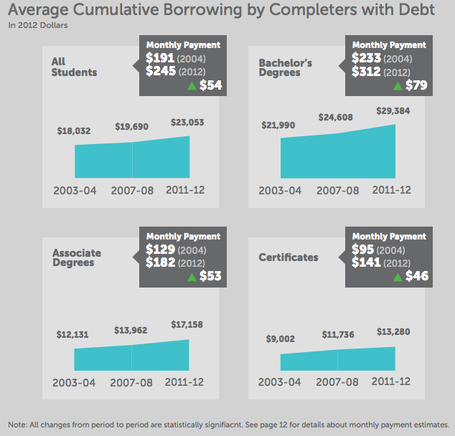 The typical monthly payment had increased 34 percent in the last decade. Government-issued loans and private student loans can’t be knocked out during bankruptcy. The majority of students will be paying $29,384 plus interest. According to NPR, in 2016 roughly 43 million students today hold more than $1.3 trillion in student loan debt. This occurs at an epidemic level because people borrow money to earn a degree that does not “have labor market value.” They come from low middle-income families who are struggling to make ends meet. Europe has state-owned schools which are heavily government subsidized. Also, many governments guarantee that the students’ loans which usually have a low interest are then marked to inflation. Governments can and do support the degree that covers 50 percent of the total cost of the course. That and also the combined lack of profit interest means that university will be far cheaper. In Europe, the issue is supply and demand and European governments have set in place social and economic policy decision for higher education as a priority like the public health insurance that many have. Many Americans are in fact moving to Europe to earn their degrees and many pay less than $10,000 a year with the fact that many follow internship programs to prepare them for the workforce right after they graduate. Going to Europe for college is of course not a solution for students as many cannot afford to live abroad and are not interested in European culture. 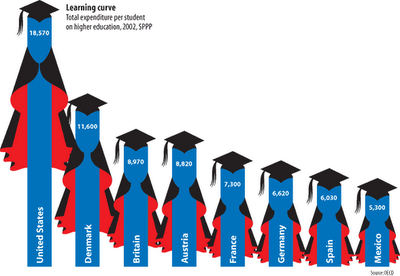 Not everyone has the means to go to college outside the United States. 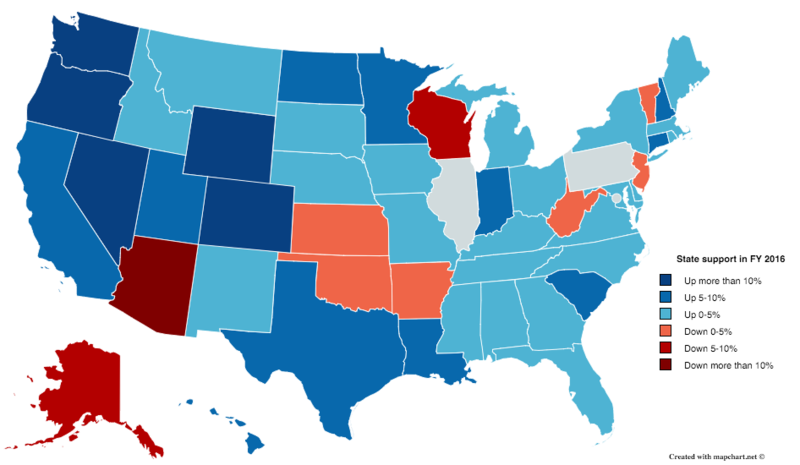 But, unless state legislatures suddenly decide to pour much more money into higher education, those trends are probably going to continue. And that means incomes need to start growing again in college to really feel affordable — even if the tuition bills don’t get much bigger from year to year.